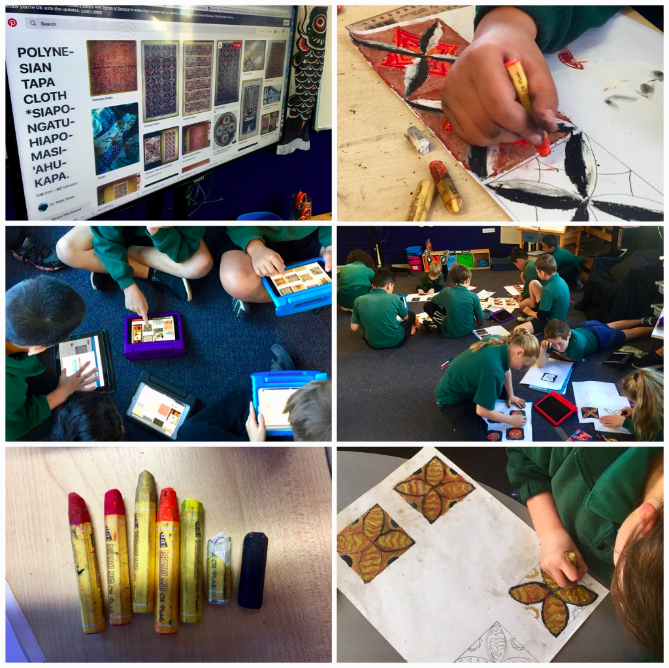 Last week a group of us were exploring Samoan siapo art and spending some time creating our own siapo-inspired patterns. To develop our value of being connected, and showing the connection between us, we are working towards creating a collaborative art piece to display in our new classroom. All going to plan, we will be moving later this week. We began the morning by watching a video of some Samoan villagers creating siapo, following a special process from start to finish. We make our thinking visible on a large whiteboard by completing a See - Think - Wonder routine. It was interesting discussing how the art can be respected by other cultures too, not just people of Samoan heritage. We decided on our process and how we would manage our time and materials. The desired outcome was for each of us to have four 10cm x 10cm coloured squares (everyone's would be different, but the four we each create would be the same). We would then all contribute these to a large collaborative piece that includes everyone's pieces. Below are some photos of us working on this project. Check out our individual student blogs for personal learning reports of the day. We will share images of the collaborative piece once installed in our new room.